Harare — Human rights groups have decried the killing of protesters by security forces and the subsequent internet shutdown in Zimbabwe. 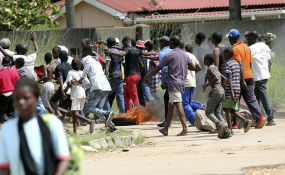 It is estimated eight people have been killed and 25 others wounded during demonstrations that erupted countrywide after the government of President Emmerson Mnangagwa announced an increase of 150 percent in the price of fuel to over US$3.1 (R47) per litre. This led to the Zimbabwe Congress of Trade Unions (ZCTU) calling for a three-day national strike that started on Monday. Police responded brutally with over 200 people arrested. Human Rights Watch (HRW) urged government to probe the use of live ammunition. "Those responsible for using unlawful lethal force should be promptly investigated and held accountable," Dewa Mavhinga, HRW Southern Africa director, said. Police brutality comes months after security forces killed six people during post-election protests in Zimbabwe. Muleya Mwananyanda, Amnesty International's Deputy Director for Southern Africa, said Zimbabwean authorities must promptly investigate the latest bloodbath. "Firearms may only be used as a last resort, and when strictly unavoidable, to protect life," Mwananyanda said. The organisations also lamented the shutdown of internet access as the strike entered its second day on Tuesday. The Zimbabwe Association of Doctors for Human Rights (ZADHR) said this disrupted efforts to coordinate much-needed medical assistance for victims of police shootings. Government spokesperson, Nick Mangwana, vowed the administration would crackdown on alleged elements bent on taking advantage of the current fuel shortages to cause and sponsor unrest and instability in the country. Zimbabwe suffers chronic shortages of money (foreign currency) after it abandoned its dollar in 2009. Shortages of commodities persist. Zimbabwe: Is Govt Really Ready for Business?